Parents! If you’re endlessly searching for safe, healthy, affordable ways to keep your kids entertained, why not consider a day at your local Delta Force Paintball Centre? Here are five reasons why paintballing is perfect the perfect activity for a kids birthday party or just a day out with friends! 1. Paintball lets kids’ imaginations run wild! Kids love to be creative, and there’s no better place to let their imaginations run riot than a day at your local Delta Force Paintball Centre. Say goodbye to a day of video games and hello to our selection of epic selection of Hollywood inspired game zones! Will they tackle the Tomb Raider pyramid with enough nous to be victorious? There is no better bond than one between teammates! While they’re hunting down the opposition, teammates naturally become closer as they share the common goal of success. Whether they’re playing against their friends or alongside them, questions such as ‘did you see that shot?’ and ‘how did you manage that?’ will be never ending. Pass the parcel is so last summer! There is no better way to celebrate getting a year older than a day of paintball with their favourite friends and family. While they’re all kitted up in our top of the range equipment and body armour, they’ll be feeling like a warrior inside and out! Not every child is into the typical games you find in the playground, but there is no harm in testing out their competitive skills in a whole new environment! Football, dodgeball or even basketball can be great to improve your child’s urge to win, but there is nothing quite like working with your closest friends to be crowned winners on the paintball battlefield! 5. No raining on this parade! If you were to book a bouncy castle for your back garden only for it to pour with rain, you’d be very disappointed. A day at Delta Force Paintball will never be washed out by a little drizzle, so come ready with your favourite camouflage or fancy dress and enjoy our epic surroundings come rain or shine! 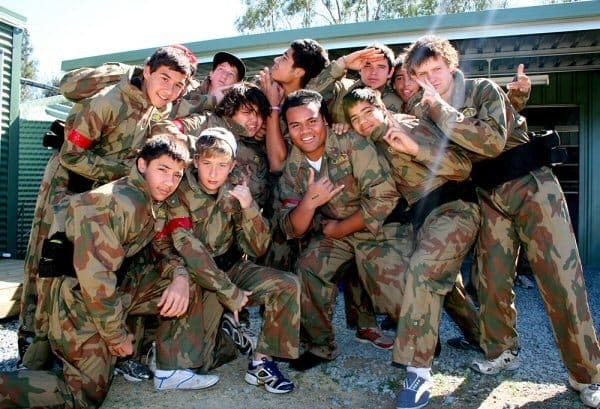 Are you ready to book an unforgettable kids paintball birthday experience? Why not call one of our friendly event coordinators on 0844 477 5098? Alternatively you can visit our booking page to request a call back.